No Scots have made it through to the last eight of the British boys championship at Royal Portrush. The last survivor was Aidan O'Hagan (Old Ranfurly) who beat top seed Robin Williams (Peterborough Milton) 3 and 2 in the morning second round. In the afternoon O'Hagan (pictured) was beaten 7 and 6 by Conor Gough (Stoke Park. Aussie Scot Connor McKinney lost by 5 and 4 to Nicolai Hojgaard in the morning second round. Another Scot to make his exit before lunchtime was Wilson Connor (Castle Park), beaten by one hole at the hands of Jose de Sousa (Australia). Ireland’s Mark Power booked a spot in the quarter-finals of the 92nd Boys Amateur Championship with a back-nine surge at Royal Portrush today. The Kilkenny golfer, who was the joint leader after stroke-play qualifying, was the only Irishman to reach the last eight following his 4 and 2 victory over the Netherland’s Jerry Ji. The two-time Irish Boys Amateur Champion found himself trailing Ji by one at the turn but found his form on the back nine, notching up four birdies, including one at the par three 16th to seal the win. Power, pictured by courtesy of Getty Images/R and A, who earlier defeated Italy’s Simone Armando Colozza 6 and 5 in the morning’s third round, will now take on England’s Joseph Pagdin after he progressed to the quarter-finals following a one-hole victory over Australia’s Jose de Souza. Pagdin earlier knocked out the defending champion, Pedro Lencart – who was bidding to become the first back-to-back winner since 1930, in a match that went to the 19th. Leading qualifier Robin Williams also departed after suffering a surprise 3 and 2 defeat by Scotland’s Aidan O’Hagan in the third round. 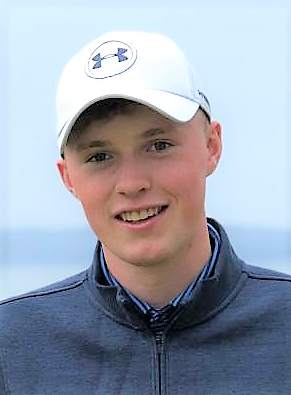 O’Hagan, playing in his first Boys Amateur Championship could not maintain his form in the afternoon, however, when he ran in to an in-form Conor Gough who inflicted a 7 and 6 defeat on the young Scot. The 15-year-old Englishman, who won the McGregor Trophy in July, will now face the highest-ranked player in the field, Nicolai Højgaard. Gough, who previously knocked out histwin brother Rasmus in the second round, will take on Højgaard in the first match of the day tomorrow. Højgaard secured his own spot in the next round after a dramatic finish on the last in his match with Italy’s Lucas Nicolas Fallotico. Leading by one, the Dane found himself in the greenside rough with his second shot and pitched his third into a ditch. His recovery shot struck the flagstick settling around five feet from the hole. The Italian was left with a five-foot putt for par to take the match to a play-off but failed to find the cup. Højgaard showed real composure to roll in his own for bogey and take the match by one hole. He earlier defeated Australian-based Scot Connor McKinney by 5 and 4. England will have four quarter-finalists in total with Jensen Hull and Max Hopkins joining Pagdin and Gough. Hull defeated countryman Curtis Knipes 4 and 3, while Hopkins ended Portugal’s hopes by winning 5 and 4 against Daniel Rodrigues. Gustav Andersson from Sweden secured his spot with a one-hole victory over Italian Filippo Celli and Spain’s Jose Luis Ballester defeated Ireland’s Joshua Robinson 3&1. For full results, draw and scoring visit www.Randa.org. Admission and parking at Royal Portrush is free. “I played really well today in both rounds. This afternoon I didn’t play as well but I got around and was holing the putts at the right time. “I’m playing the other brother, Nicolai, tomorrow so I have got to take him down now. It should be a good game. I’ve beat his brother, so I am going to have to play just as well to beat him. “Today I probably played some of the best golf I have played all week. I made some good birdies this morning in tough conditions. It was the same again this afternoon. “Jerry is a really good player He wouldn’t go away. He was driving really well and made it tricky for me. I’m delighted to get the win in the end. “I have had a few nice wins in the last few years and this year I have had two seconds and a third in men’s events so I just really want to finish off the year with a win and there is no better tournament to do it than in the Boys Amateur – this is the biggest one we play. “On the 17th I holed out to be one up on the 18th. We both had very good tee shots but he hit a wonderful second shot into the first part of the green and I was between two clubs and I picked the wrong one and hit it way right. “I was just trying to make a bogey and hoping he would three putt. He did so now I am standing here as the winner. “I hit it straighter off the tee so my dad didn’t have to look for my ball as much which took a lot of stress off him. I also holed easier putts from shorter ranges. “I was happy just to make the cut and anything else is a bonus. Thinking about last year, this is a harder course, it’s a lot bigger. “I started well and finished well but there was a bit of scrappy patch in the middle. Luckily, he had one as well. “I’ve won two matches on the 18th hole and one on the 21st so it feels great to play well when its important. “I haven’t won any tournaments this year, but I have been playing pretty well. It feels nice to play a links course and play well in the wind.